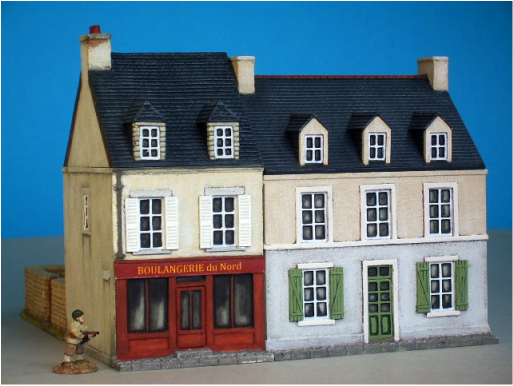 All figures and vehicles shown are 15mm scale for comparison purposes and they are not included in the sale of the model building or terrain piece. 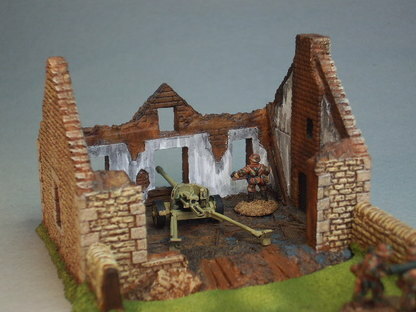 All models are supplied unassembled and unpainted. a hollow ground floor room and a pavement to front. includes 6 drop in closed windows to customise the model. includes 3 drop in closed windows to customise the model. Both buildings have a lift off roof, a fixed first floor, a hollow ground floor room, a corner rubble piece and pavement to front. size 128 x 88 x 17mm internal height walls. For use with F5 & F2 shown in rear view. to fix open to customise the model. size 128 x 88 x 11 & 17mm int. ht. walls. 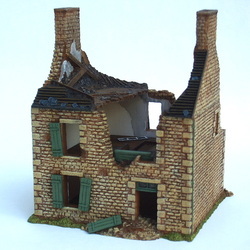 Rear view of battle damaged shop F3 & house F6. Double gates may be cut from the walls to fix open. size 140 x 70 x 117mm high. There are 15 large window apertures. code F7. includes a pack of 8 closed drop in windows. only a few miles inland from Utah beach. The roof lifts off for access to the first floor section, with a lift out floor for access to the ground floor. The Ground & first floor walls sections require fixing together either permanently with glue or with double sided tape for a temporary fix. The ground floor has an internal floor and pavement to the front and left side. ​size 82 x 70 x 105mm high. The roof lifts off for access to the first floor, with a lift out floor for access to the ground floor. Pavement to front. code F8. includes a pack of 5 drop in closed windows as shown. code F8w. 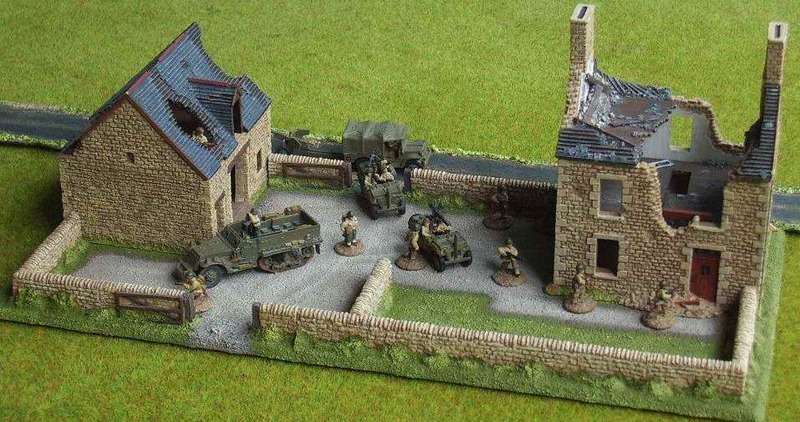 price £15.40 includes a pack of 9 closed windows. ​see photo below right bottom row. code F7D. includes a pack of 8 drop in windows. Both buildings have a lift off floor and roof. includes 4 drop in windows to customise the model. Painted church photos above are of the original model. tile effect floor. see photo below. prepared for defence with sandbags in the front doorway. size 82 x 60 mm. for use with F15. Garden size 95 x 93mm. Overall size with F15 is 152 x 93mm. Outhouse F17 also shown. with lift off first floor and damaged roof. 8mm wide pavement to front & side. OA size 90 x 80 x 105mm high. 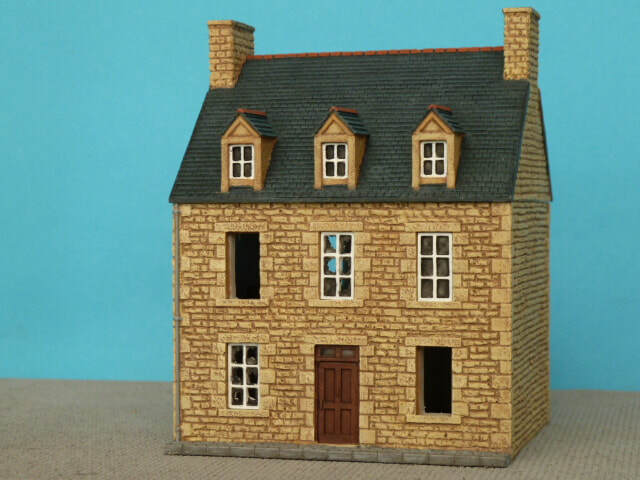 The 4 large window apertures are open to accept 4 drop in undamaged windows to customise the model. Shutters not included. is the same as F18 but with a pack of 7 window shutters to customise the model. 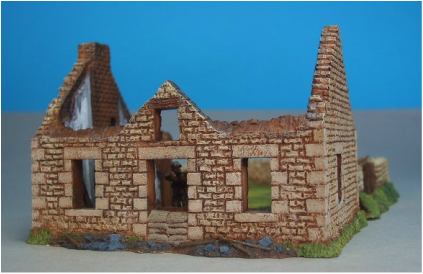 The La Haye Farm Set from the Waterloo Range is perfectly suited to conflicts from the 17th century to present day. Barn F11 and Farmhouse F9 roadside view. Damaged Barn F12 and damaged Farmhouse F10. Both buildings have lift off first floors and roofs. 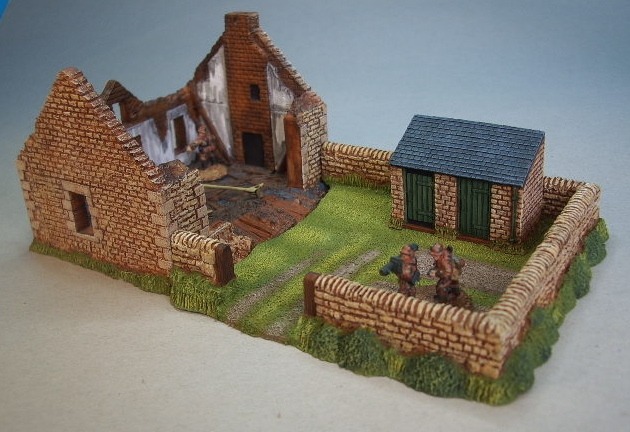 A farmyard diorama built using rustic walls. As F14S but with a lift off damaged tower only. The detailed belfry floor is now exposed. F15 rear view showing rear garden F16 attached. is a solid casting. size 40 x 18 x 30 mm high. New - a corner piece of rubble is now included and will be shown when the photo is updated. The barn has a lift off roof and internal size 60 x 33mm . 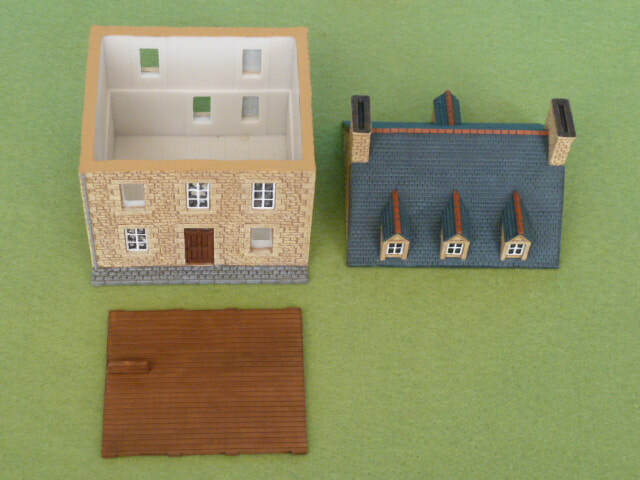 The farmhouse has a fixed roof and internal size 31 x 55mm. 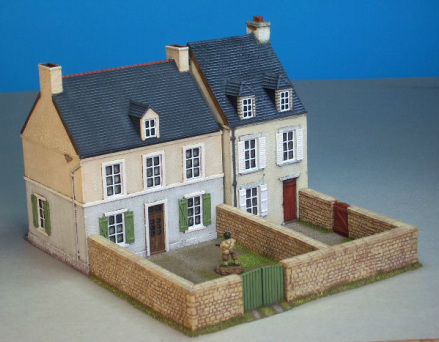 See the Waterloo range for more buildings suitable for France & Belgium.